Spider-Man: Homecoming is well put together. It’s well-written, its characters are vivid and its cast mostly deliver solid performances. It’s also the culmination of a decade-long process whereby Marvel has systematically eviscerated their most famous character into the unrecognizable, voice-cracking, immature and over-eager child that will now be solidified in the Marvel Cinematic Universe for the foreseeable future as the definitive version of the character. There is even a joke in the movie when Peter tries to interrogate a criminal to gain crucial information and ends up shrilly insisting that he’s not a girl; he’s a boy — I mean, a man. The film is all too aware of its infantilization of its titular character, seeming to desperately remind the audience at every turn. “I’m sick of Mr. Stark treating me like a kid!” Peter whines. His best friend Ned’s response, “You are a kid,” is redundant: we were already reminded by the obnoxious, pubescent intonation of the complaint. With every new scene, the film throws Peter’s youth in our face. Peter has a Spanish test. Peter plays with LEGOs. Peter has never been on a plane. Get it? He’s young. He’s a kid. He’s so cute. And it’s a terrible shame, because aside from the fact that it gets my favorite fictional hero so horrifically wrong, I really liked Homecoming. Lightgun Galaxy’s Josh Wirtanen recently wrote about how the film represents the best of Marvel Studios’ ability to bring out the human element in its costumed characters, and I agree. Michael Keaton gives a particularly strong performance as the Vulture, which is all the more welcome because one of the few weaknesses the MCU’s films have had since the beginning is a lack of compelling villains. I assume, at this point, some portion of readers are dying to correct me. 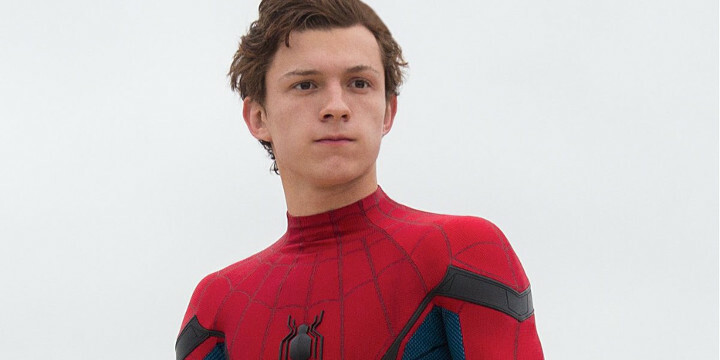 The idea that a high school-aged Peter Parker could somehow fundamentally misrepresent the character because of the emphasis on his youth is absurd; any serious fan knows that the original incarnation of the character, as created by Stan Lee and Steve Ditko, was a high school student — young, awkward, and struggling to balance his secret life with the pressures of being a teen. I’m glad you brought that up. Let’s talk about the Lee-Ditko run. These panels are the conclusion of The Amazing Spider-Man #7, coincidentally the second appearance of the Vulture. Peter’s final line is a reference to the fact that as Spider-Man, he earlier webbed up Jameson’s mouth, remarking that the webbing would dissolve in an hour. 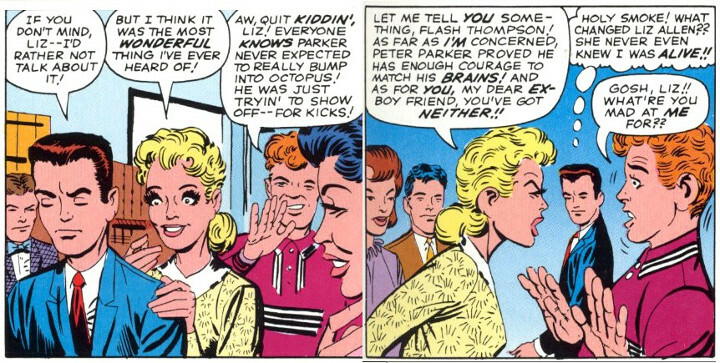 Yes, the woman sixteen-year-old Peter is successfully flirting with is Betty Brant, the secretary at the Daily Bugle, where Peter is — by his own initiative — employed as a freelancer. It’s difficult for me to reconcile the distance between this dialogue and the goonish stare Tom Holland’s Peter adopts any time he’s confronted by his crush. The idea that Peter was always socially awkward is really a myth, one that I think stems primarily from Tobey Maguire’s performance in the original Sam Raimi film trilogy. In the Lee-Ditko era, Peter was a social outcast, but this was because of his interest in intellectual pursuits over physical ones and the relentless mocking of Flash Thompson. But it really doesn’t take long for that to start changing. 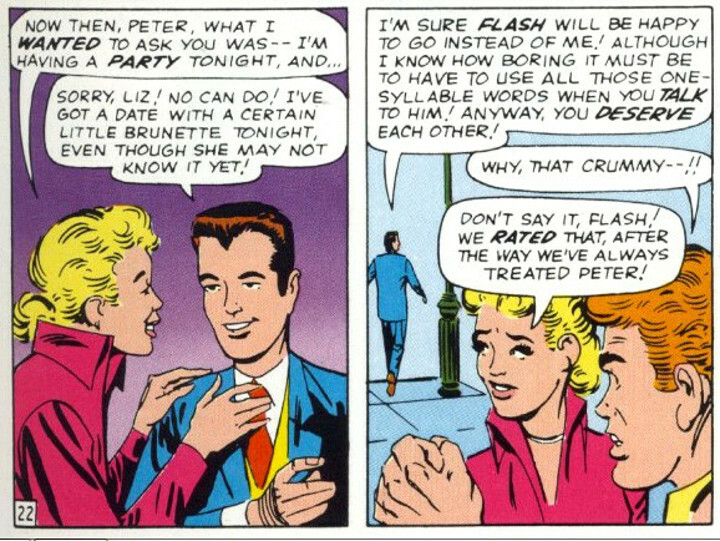 In Amazing Spider-Man #12, for example, Liz Allen, Flash’s girlfriend who until then had consistently joined the jock in tormenting Peter, suddenly begins to develop feelings for him and even turns on Flash. It’s important to note that there’s no change in Peter’s own behavior that precipitates the shift in social dynamics — it just happens, because there’s apparently something about Peter that’s actually very attractive to women. But rather than awkwardly bumble over the attention like his Homecoming incarnation, Peter confidently dismisses her at the end of the issue because he’s got a hot date with a secretary. One of the things that should be clear from these panels is the way that Peter was portrayed by both his writer and his artist: anything but childlike. Ditko did not draw Peter baby-faced, diminutive or wide-eyed as he’s portrayed in Homecoming, but rather sharp-featured, determined, and sometimes scornful or angry. Lee never wrote him tongue-tied, and often showed him to be quick-witted. 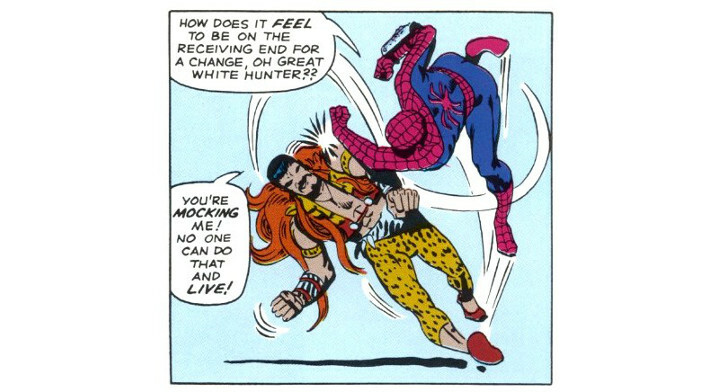 This, of course, was a crucial element of his persona as Spider-Man — but has, like his status as a social outcast, been distorted over time. There is an idea out there that Spider-Man is funny, and of course that’s true. But over time it’s developed into the notion that Spider-Man is at least partially a comedy, and that’s deeply misguided. There’s a scene in Homecoming, for example, where Peter dons his Spidey suit and takes off to chase the villains, but being in the suburbs, he can’t go swinging around on skyscrapers like he usually does. In a sequence that is nothing short of total slapstick, he crashes through fences and sheds, runs across people’s lawns as they’re having cookouts, and awkwardly greets them as he passes. The film is so proud of the way it mimics Ferris Bueller’s Day Off in this scene that it has to make sure everyone gets the joke by showing the movie on a TV in the background. This is not how Spider-Man is supposed to be funny; he’s supposed to be clever and quick-witted. His humor comes from mocking his adversaries — usually villains he’s battling, but sometimes also the jerks in his life, like J. Jonah Jameson and Flash Thompson. In particular, Spider-Man has often used his humor as a way of aggravating his opponents by refusing to take them seriously, a brilliant response to the inherent hubris of the supervillain. His wit is barbed — not vicious, but definitely demeaning, deliberately infuriating and derisive. While Homecoming occasionally manages to replicate this aspect of Spider-Man’s personality, most notably in the robbery sequence where he pretends to believe the criminals are the Avengers, it fails to ever bring out this characteristic where it matters most, when he’s fighting the Vulture. This is because to have Spidey openly mocking his most vicious foe would be contrary to the overarching theme of the film, that he’s out of his depth. But it should send a deeply troubling signal when the film that’s being praised for bringing back the humor so crucial to Spider-Man can’t even let him be funny in the one way he originally was without falling apart. It’s troubling because at the core of the film is a story about a kid who desperately wants to be a hero and impetuously defies the adults in his life to pursue his dream, and that’s a poor substitute for the substantive core of the original Spider-Man story. The Lee-Ditko run on Amazing Spider-Man contained a dark undercurrent of tragedy. It was cleverly hidden under the comic’s bright colors, snappy dialogue and vibrant characters, but impossible not to sense amidst it all. It came forth in Peter’s closed-off anger, so often expressed toward figures like Flash and Jonah, who he has the power to silence but can never bring himself to. It was recognized in his supporting cast, like Betty Brant, who Lee used to make it abundantly clear how dark Peter’s inner life really was. One of my favorite panels of the Lee-Ditko run is the conclusion to Amazing Spider-Man #4. An exhausted Peter has returned home after saving his classmates from the Sandman, only to be forced to flee from the police with his mask on and then endure the ridicule of the people who owe him their lives with it off. Shoulders slumped, occupying a minority of the frame, standing alone in the darkness, he contemplates whether or not he’s even sane to do the things he does. His mask looms bigger in the frame than he does, occupying the foreground ahead of him, the single controlling force in his life. Peter’s story is not a comedy. This is where Homecoming truly fails. Where it constantly screams youth, youth, youth, the true story of Spider-Man is in fact a story of the loss of youth — of a boy who, through extraordinary circumstances, is forced into adulthood. That Homecoming avoids ever confronting the tragic nature of Peter’s origin as Spider-Man is the measure of how deep this failure runs. The film was right not to rehash the origin story yet again, but in refusing to even acknowledge what is supposed to be the driving force behind Peter’s war on crime, it is the crowning achievement of a decade of infantilization that the character’s been subjected to. In the place of the ever-present memory of his murdered uncle, Homecoming gives Peter the looming, boisterous presence of Tony Stark. When Peter’s insistence on pursuing supervillains leads to near-disaster and Iron Man swoops in to save him, he takes the scolding he receives like a penitent child, then pathetically squeaks, “I just want to be like you, Mr. Stark.” The film concludes with Tony granting his approval after all, and while Peter does turn down a position with the Avengers, finally granting him some measure of independence, it’s only through a magnanimous gesture on Tony’s part that he gets to wear his iconic costume again — in the MCU, Spider-Man will forever exist with his adopted mentor’s permission, at least as long as he wears that suit. 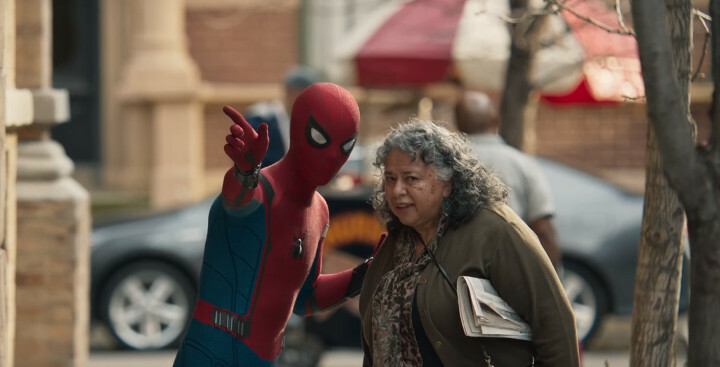 The problem with it all is that it gives the impression that Peter’s primary motivation for being Spider-Man is that he wants to be Tony Stark, and in doing so it justifies every condescending lecture he gets throughout the film. It is childish to want to be a superhero just because you think Iron Man is cool. So of course that’s what we get as motivation for this version of Spider-Man. He’s supposed to be childish. He’s supposed to be a child. Homecoming is not isolated in its infantilization of Spider-Man. This is a process that’s been at work ever since the shift in the direction of the Amazing book back in 2007. Enough digital ink has been spilled on the disaster that was One More Day, and there isn’t time here to explain its dark impact and the trend that followed. It will have to do, for this article at least, to say that youth has been the prevailing theme of the reformers at Spidey’s creative helm ever since, and it’s been reflected in his reversion to high school age and the prevalence of slapstick, pop culture references and comic relief in his various incarnations. But this film is a special landmark in the regression of the character from man to boy. Because the MCU is the biggest thing there’s ever been in superheroes; it may even be the biggest thing there’s ever been in popular entertainment. And now the Amazing Spider-Boy is a part of it. Ever since Iron Man took the film industry by storm in 2008, Tony Stark, in every incarnation, has morphed into Robert Downey Jr. Most people never knew Captain America as anyone but Chris Evans. Characters like Ant-Man and Black Panther, who would have drawn blank stares from the average filmgoer a couple years ago, are known all over the world. The MCU’s power to shape public perception cannot be understated. This is Spider-Man now. Baby-faced, hero-worshipping and constantly bumbling, he’ll be the one that sticks in the minds of a generation, playing comic relief in crossover films and delighting children and soccer moms with his goofy, naive facial expressions. And this weary fan is at peace with it. 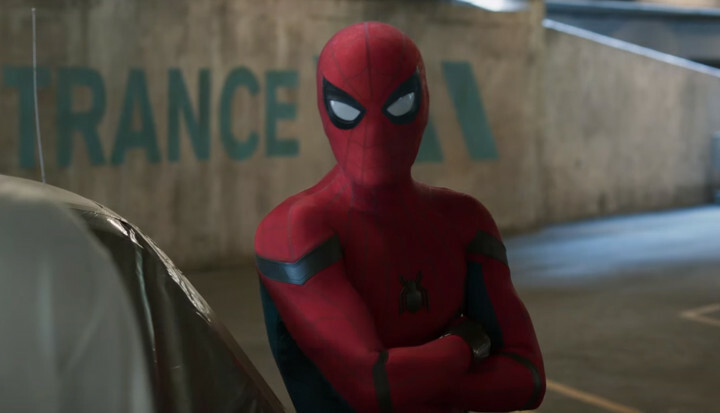 Spider-Man: Homecoming is a fun movie about a kid who wants to be a hero like his idol and maybe learns some kind of lesson while trying to be. I don’t know. That isn’t my Spider-Man, but perhaps it’ll be yours. The fight’s over; you can have him.